The U.S. government constantly vilifies Cuba, Venezuela, North Korea, and other governments it opposes, claiming that they are not democracies. Republicans and Democrats alike warn of “oppressive regimes” while telling us that the U.S. is a true democracy, and everyone here has a say through voting. But a closer look reveals that the deciding factor in U.S. “democracy” is not the vote at all, but the dollar bill. Policies are made and unmade not because of the number of votes they get, but because corporations spend hundreds of millions of dollars on ‘lobbying,’ and other ways of paying off law makers to pass the laws they want. Virtually everyone takes medication at one time or another, and access to medicine can mean life or death. Many people cannot afford medication. 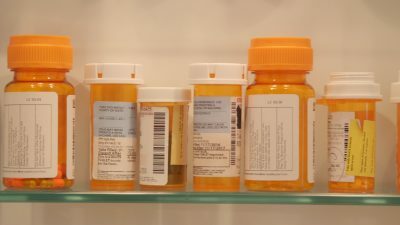 In a recent poll, the Kaiser Family Foundation found that 80 percent of people in the U.S. believe drug costs are unreasonably high. If we voted on lowering the cost of essential drugs, there is no doubt that the vote would overwhelmingly be in favor of keeping the price of medications as low as possible. During his State of the Union address in January, and again in New Hampshire in March, Donald Trump actually spoke to this sentiment. He loudly proclaimed that drug prices will drop “very substantially in the not-too-distant future.” He said he was for the federal government negotiating lower drug prices for Medicare (currently Big Pharma charges what it wants) and that consumers should be allowed to import prescription drugs from Canada and other countries, at lower prices than in the U.S. But this was just rhetoric. On May 11, when push came to shove, Trump backed down on both these measures. Why? Because the giant pharmaceutical companies are against decreasing the payments they receives from Medicare, Medicaid and other government programs because this cuts into their profits. “Big Pharma has made a huge investment in Congress, with extensive lobbying and massive campaign contributions,” said Representative Lloyd Doggett, Democrat of Texas. Drug companies and their trade associations sent out a small army of 882 lobbyists last year to line the pockets of both Republican and Democratic law makers with dollars, and to them promise funds for their next election campaigns should they pass laws favorable to pharmaceutical profit margins. With 535 members of Congress at present, Big Pharma lobbyists outnumber them almost two-to-one! And they are aggressive. Congressional aides say Big Pharma can send 10 or 15 lobbyists to meetwith two congressional aides. Lobbying isn’t the only way the pharmaceutical industry and those on its payroll attempt to influence legislatures. They spend multi-millions on advertising and donate to patient advocacy groups whose members rely on the drugs they produce. According to Kantar Media, an ad tracking company, drug companies spent $6.1 billion on advertising aimed at U.S. consumers last year. This is more than twice as much as the largest corporate advertiser in the U.S., Procter & Gamble. Another major issue in the government’s relationship with the drug industry is the “revolving door” that exists between the two. On every level, executives in the biggest drug companies and U.S. officials are constantly changing places. For example, Alex M. Azar II, the Secretary of Health and Human Services, is the former presidentof global pharmaceutical Eli Lilly and company, and Dr. Scott Gottlieb, the Commissioner of the Food and Drug Administration, worked for the government, then as a consultant to drug companies, and now is back in government. Can Azar be counted on to work in the public interests, and lower drug costs? During his decade at Lilly, the company tripled the price of its insulin and was fined for colluding to keep its prices high in Mexico. The FDA is supposed to test the efficacy of drugs and medical devices before they hit the market. Gottleib, its new head, “has consistently pushed for faster approvals of under-tested products—accepting millions of dollars from drug and device makers along the way—even when it means skipping the critical clinical trials that uncover serious problems” according to the National Womens Health Network. But Donald Trump knew this when he appointed Azar And Gottlieb to these highest of health positions. Their ‘job’ is not really to look out for the public interests. It’s to look out for the interests of the very companies the agencies they head claim to regulate. The drug company-government revolving door goes down the ranks of government. For example, John D. Dingell, longtime aide to former Michigan Democratic Representative, now works for PhRMA, the Pharmaceutical lobbying group. For six years, Gary Andres was the Republican staff director of the House Energy and Commerce Committee, which handles legislation that affects prescription drugs and the F.D.A. In February 2017, he became a senior executive vice president of the Biotechnology Innovation Organization, a trade group that lobbies for biotech companies. Andres returned to Congress last month to become the Republican staff director of the Ways and Means Committee, which has some power over Medicare, including its payments for prescription drugs. More than two-thirds of Big Pharma lobbyists are former employees of Congress or federal agencies For example, an aide to Senator Tom Harkin (D-IA), former chairman of the Senate health committee, is now a lead lobbyist for the multi-million dollar drug company Merck. Of course, all, of those going through this revolving door will give lip service to health being a human right, and that every American, regardless of socioeconomic status, should be able to access the medicine they need. But the real “need” these people serve is the “need’ for ever-increasing profits. This is why five out of the six top-profiting businesses were pharmaceuticals. It is why spending on prescription medications is higher in the U.S., per capita, than in any other country in the world. It is why paying for medicine can be the most expensive out-of-pocket health cost for Americans. It is why people are dying because they can’t afford medications. It is why 1 in 7 don’t fill their prescriptions because they cost too much. It is not just the pharmaceutical companies that do this. Every major industry, from fast food to for-profit prisons, has its own lobby, and does the same thing. The U.S. is the best ‘democracy’ the giant corporations can buy. Featured image is from Consumerreports.org.